There’s an art to hanging wall art, so we’ve put together some expert tips to help you get in the know. Knowing how to hang your brand-new wall art can sometimes be trickier than making it. Luckily for you, all of ours come with a free and easy to use hanging system, but that still leaves the question of where you should actually hang it. We’ve put together some practical tips, including some used by art gallery curators and museum directors, so that you can hang your wall art like a professional and give your photos the podium they deserve. 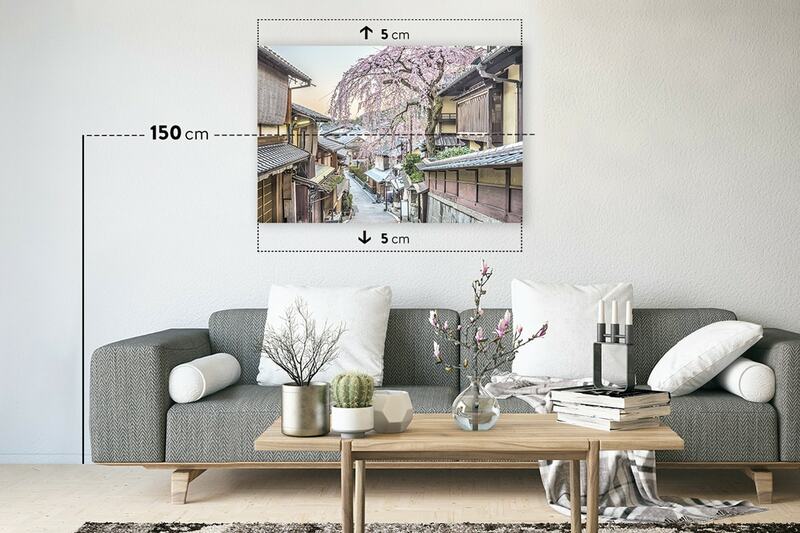 A simple rule of thumb is to hang your wall art between 145 and 155 cm from the ground to the centre of the wall art. However, the height is also dependent on factors like furniture and ceiling height, so it doesn’t have to be a completely rigid rule. It’s always best to try it out for yourself and figure out what works best in your space. We recommend you follow the 4/7 rule. This means that when working with an empty wall, you should hang pieces that take up around 4/7 of the width of the wall. A quick and easy way to calculate this is to multiply the width of your wall by 0.57. For example, if your wall is 3 metres wide, then calculate 3m x 0.57, which is about 170cm. 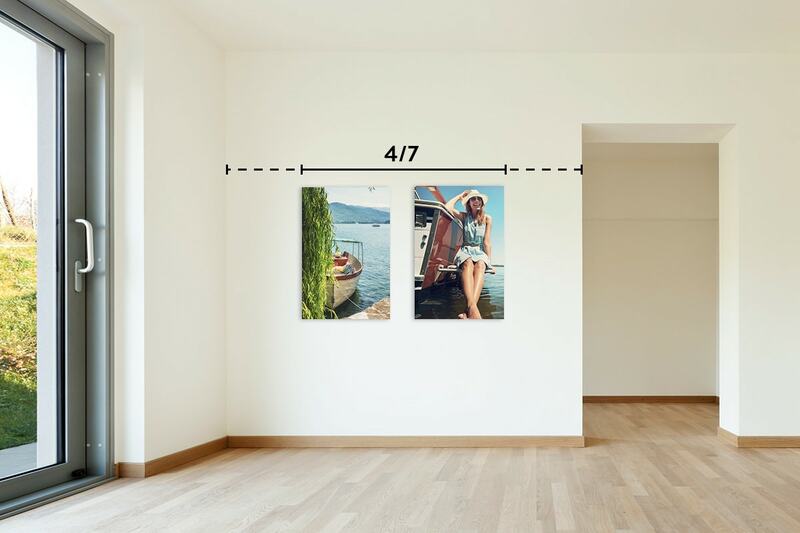 Now you know the ideal wall-to-art ratio, you need one or more pieces of wall art that add up to 170cm in width. For example, you could print two pieces of wall art that are 60 cm wide and leave 50cm of empty wall in between them. This adds up to a total width of 170cm (50 + 60 + 60 = 170), which is 4/7 of a 3m wall. Centre them on your wall, and hey presto – the perfect ratio. Your furniture and wall art don’t need to fight for attention. Make them work in harmony with these handy tips. Ensure your living space looks its best by following these tips for hanging wall art above your sofa. 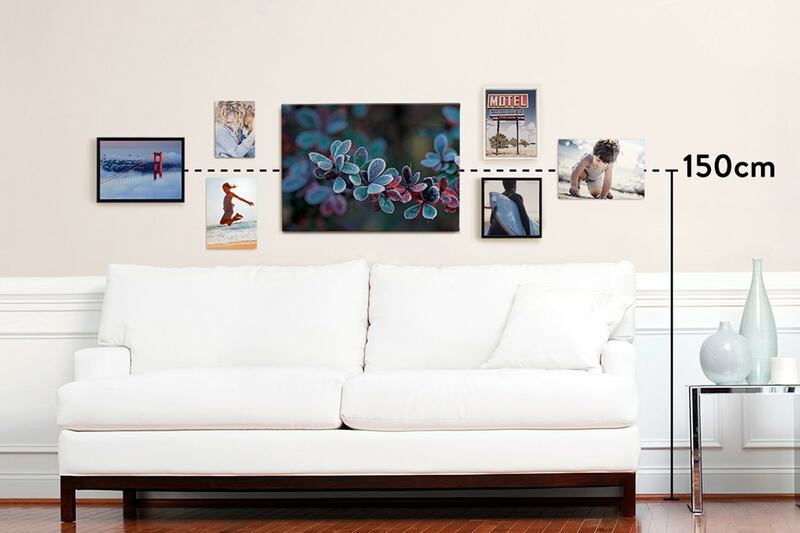 Your wall art (or grouping) should be at least 2/3 the length of the sofa. Use one large piece or two or more smaller pieces in a group to create the size you need. Photos should not be wider than the sofa otherwise it will overwhelm the room. 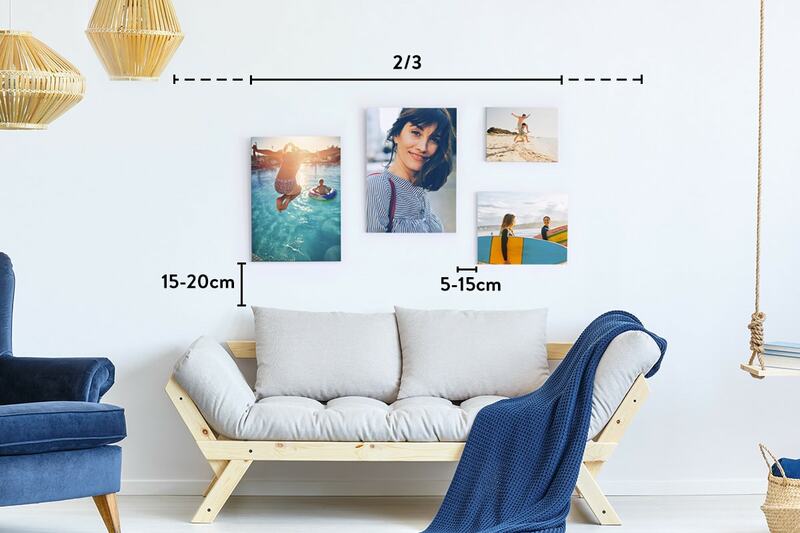 The bottom of your frame should hang 20 to 25cm above the back of the sofa. 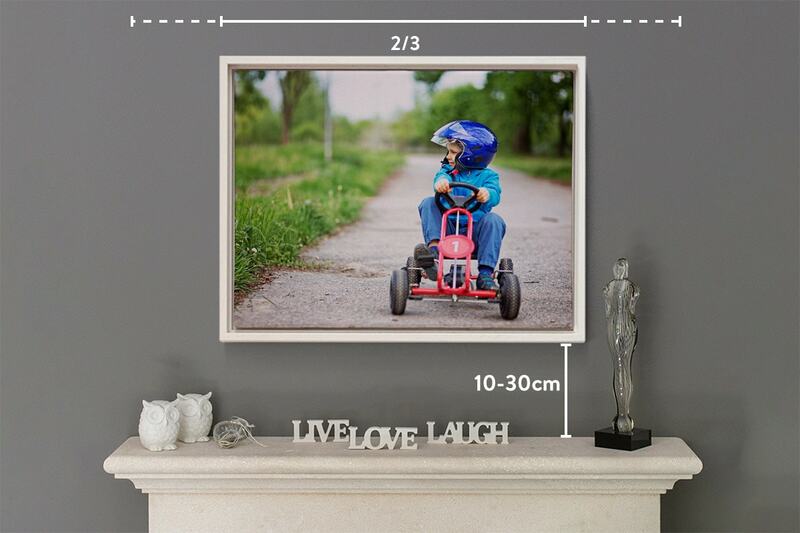 When hanging a group of pictures, leave 5 to 15cm between each frame for proper spacing. Photo Tip: It’s in your living room, where you’ll likely spend most of your time, so choose a wall art of your favourite photo that you’ll never get tired of seeing at every day. Similar to the sofa rules, hanging wall art above your mantelpiece doesn’t need to be complicated. Wall art should be 2/3 of the width of the mantelpiece. The bottom of your wall art should hang between 10-30cm above the top of mantelpiece. If you have ornaments on the top of the mantlepiece you can adjust this rule slightly to leave more space. Photo Tip: Mantelpieces are often already quite busy with ornaments and decorations, so choose a picture that won’t overwhelm. Try a candid portrait or even a series of smaller pieces with quotes on them. Hanging wall art in the stairway is a great way to make use of otherwise neglected space. 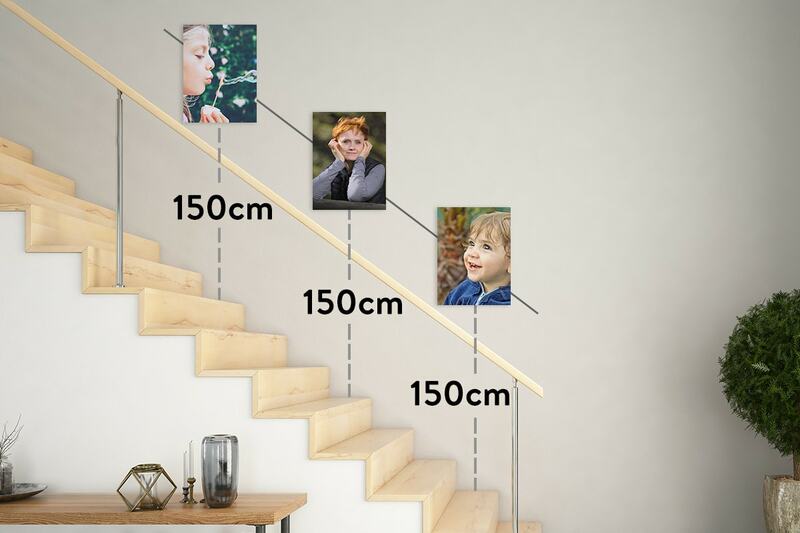 Hang each piece with the centre sitting between 145-155cm above each step. Make sure you choose the same height for every piece (for example, 150cm). This way, your composition will look clean and sharp. Unless you’re hanging very small wall art or prints, don’t hang one above every step, but leave at least two or three steps between each piece. This method works best with similar size wall art. Photo Tip: Family photos are a great way of telling a story as you descend (or ascend) your staircase, showing photos from throughout the years to create a little stroll down memory lane. Your bedroom should be a place of calm and tranquillity, so don’t crowd your walls with too much wall art. Instead, pick one or special pieces and hang them above your bed following the steps below. 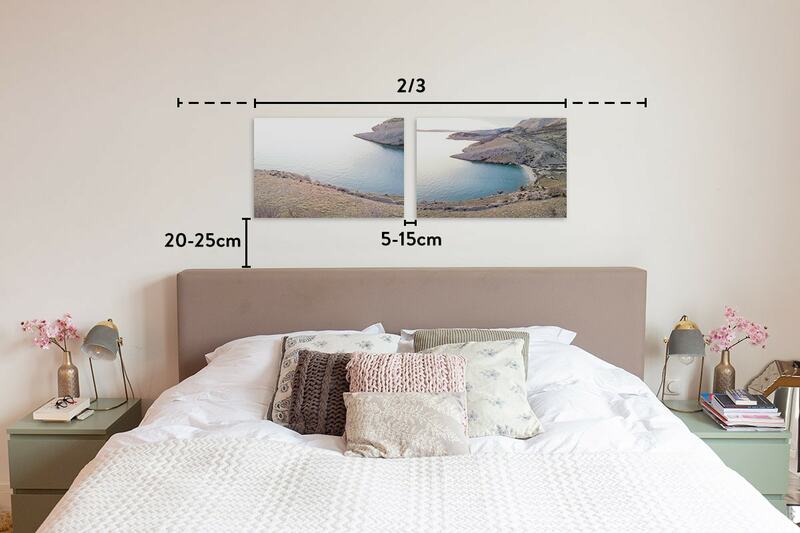 Your wall art should be about 2/3 the length of your bed/headboard. The bottom of the piece should sit between 20-25cm above the bed/headboard. If you do decide to hang more than one, leave between 5-15cm of space between each piece. Photo Tip: Try a serene landscape, or anything that instills a sense of relaxation. The important thing is that the colours are soft. Create a wall art cluster in your home and it will become the focal point of your living space. 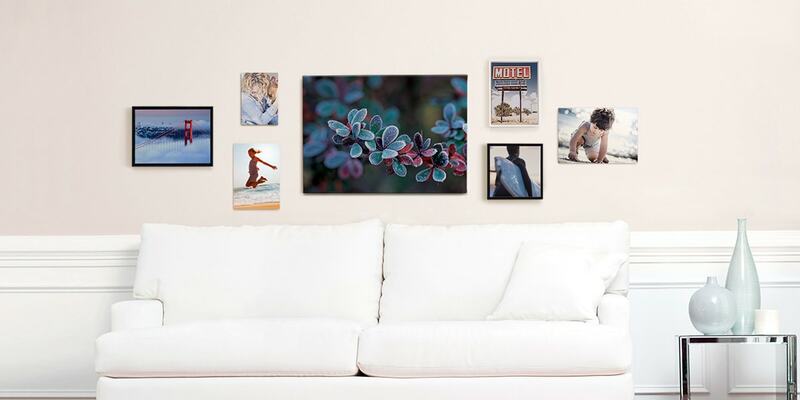 Choose the wall art and prints you want to hang together. Pick the heaviest-looking piece to hang in the centre of your composition. This is what experts call ‘the anchor piece’. It’s usually the largest and most striking piece as all other ones will gravitate around it. Hang it so the centre sits between 145-155cm off the ground. Build your gallery around the anchor piece. Imagine a central line running horizontally through its centre and use that as a reference point to create a balanced composition. Be sure to keep a standard distance between all pieces, and just trust your instinct and sense of style – the result will be a stunning wall art cluster. Photo Tip: Wall art clusters work best with a variety of different photography styles, colour palettes and materials, so get experimenting! Unlike a wall art cluster, a wall art grid will consist of several different pieces but all in the same size and shape to create a symmetrical display on your wall. First you need to choose an even number of pieces that are the same length and width. This works better with smaller pieces, so try not to go wider than 20cm. Make sure the horizontal centre of the grid sits at 145-155cm from the bottom of the floor, and if the grid is above a sofa or another piece of furniture, look at the tips above for getting the height right. Hang half of your pieces above the horizontal centre and align the other half below, ensuring the horizontal and vertical distances between each piece are consistent. You can choose to leave 5cm of vertical distance and 7cm of horizontal distance between each piece. As a rule of thumb, don’t leave more than 5-7cm of empty space between each piece. If you want to make the great really stand out, use frames – which are available for all our wall art options. Photo Tip: Use similar photos or a recurring theme like nature, people, or cityscapes. We’d recommend uncluttered photos with soft colours, so the grid doesn’t look too messy or overloaded. So now you know how the experts hang their wall art you can have a go for yourself. Share your wall art displays with us using #bonusprint. We can’t wait to see what you’ve been creating!